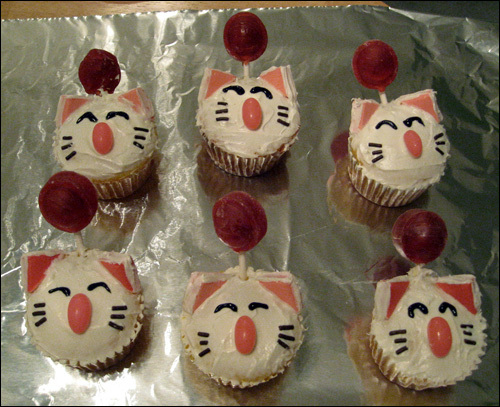 Final Fantasy week continues with moogle cupcakes! 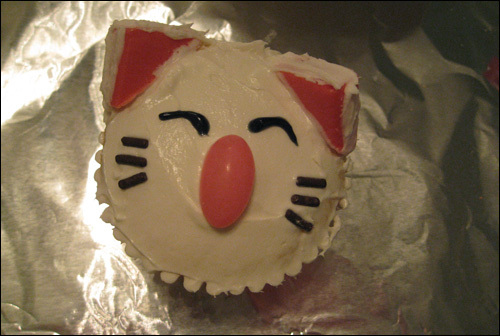 Cute teddy-bear-like beasties make for cute cupcakes. The pompom was the trickiest part of figuring this cupcake out. The bobble is so big that it couldn't be a jelly bean, since that would make it the same size as the nose. A gumdrop on a toothpick was going to be the tuft, until the bulk candy section of the grocery store was discovered. And there, tucked away in the bottom left corner, was the answer - lollipops! 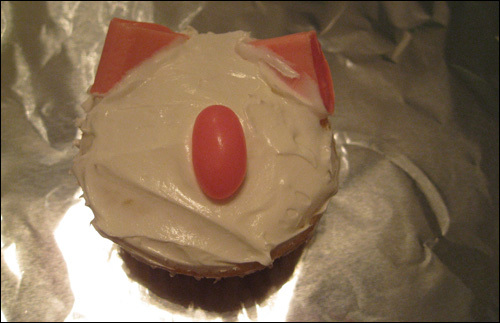 The moogle cupcake ingredient list was complete! 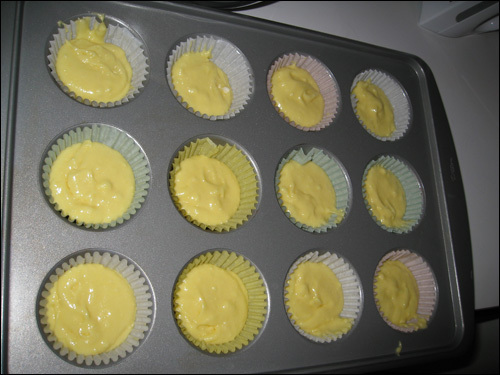 Preheat oven to 350F and whip up the cupcake mix. Spoon the mix into cupcake pan. 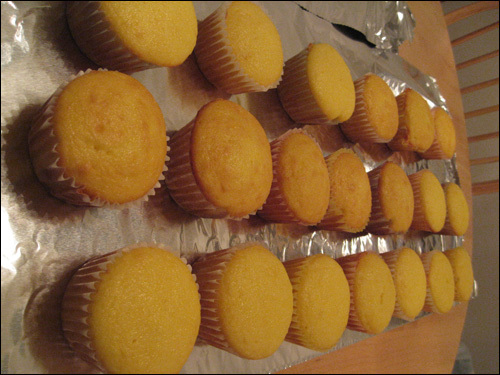 We don't want super puffy cupcakes, so fill to roughly halfway to 2/3rds full per cupcake section. 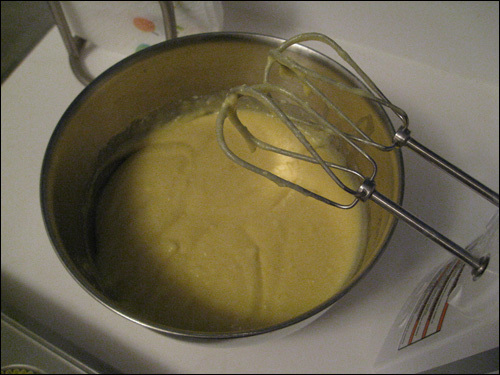 If the batter is looking a little yellow, it's not my camera. It's because I picked up lemon cake mix instead of white. Whoops. At least it was on sale. Bake for about 10 minutes. Cupcakes are done when poked with a knife and the knife comes out clean. Allow to cool before frosting. While the cupcakes are cooling, diagonally chop up the starbursts. I used mostly pink wrapped starbursts, but tried a few of the red as well. Either one will work out a-okay. 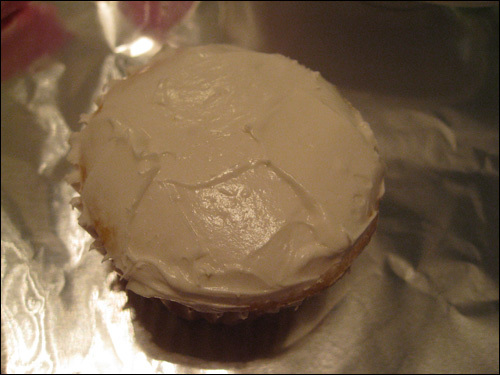 Frost the cupcake, making sure to get a good amount around the top edge. 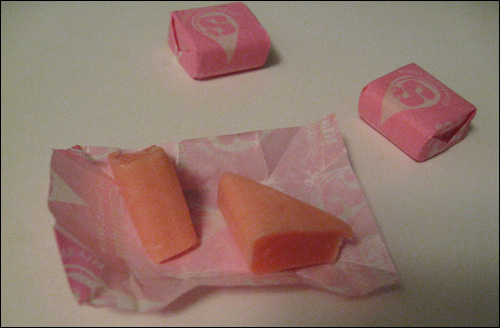 Take two pieces of a starburst and push into the frosting-heavy top. 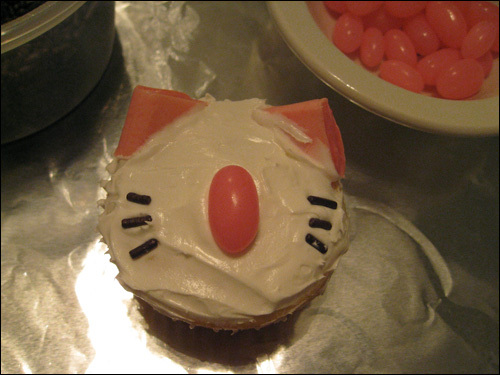 You won't need to push the starburst into the cupcake, the frosting will hold the ears just fine. Add the big ole pink jelly bean nose. Place three chocolate sprinkles on each side of the nose. You might want to keep a paper towel at your side for this - your fingers will get sticky with frosting! 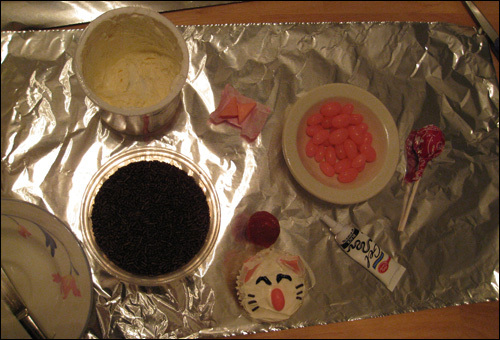 Adding some frosting around the edges of the ears and draw the eyes with the black gel. Take a lollipop and chop about an inch off of the stick. 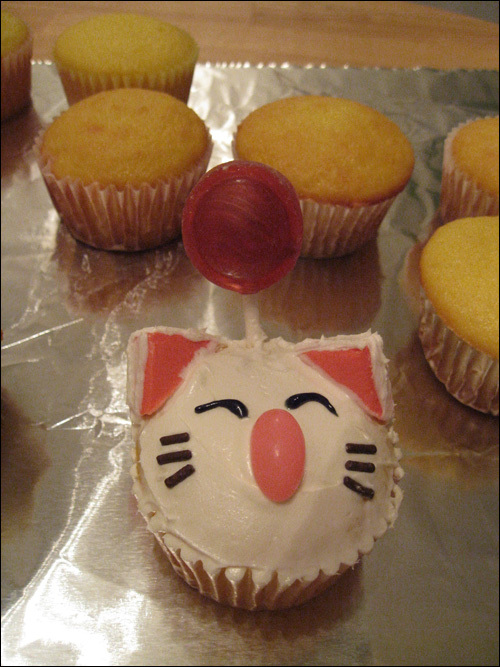 Otherwise, the lollipop will be standing out too far from the cupcake and will topple over. Be careful when cutting! The lollipop stick end will blast off when being cut. When I was cutting away, I tried aiming for the kitchen trash to see if I could get one in, but no dice. I suppose you could cut over the trash can and save yourself the projectiles flying around, but where's the fun in that? Stick in the lollipop at an angle to create the pompom. Be careful of sticking in the lollipop almost completely horizontal. 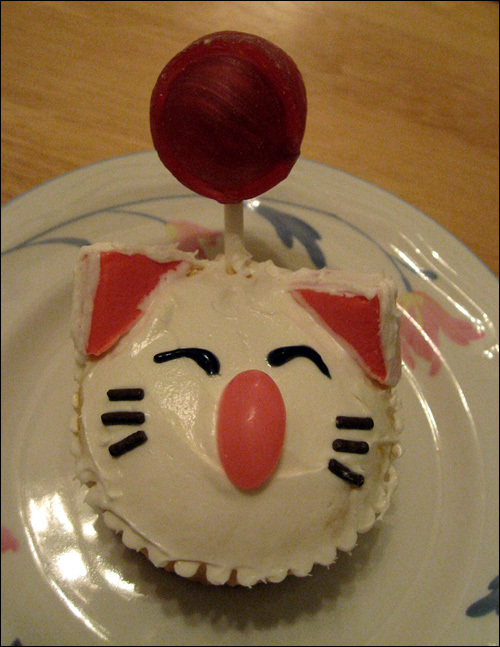 At that angle, the weight of the lollipop will rip the cupcake, and it isn't a moogle without its top bobble. All the fun decorating stuff. Moogles! 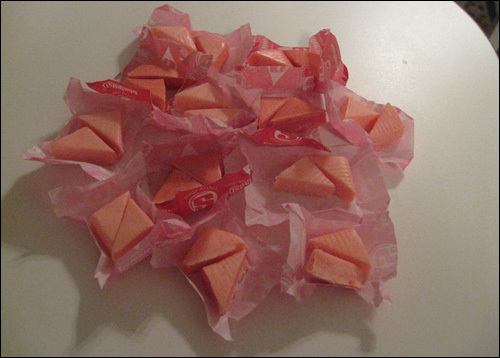 The bottom left and the bottom right use red starbursts instead of pink. Both look just peachy. Aww, how cute! I'm going to make these for one of my DnD meets. tomorrow is my birthday and my mom is getting me a big moggle cake! 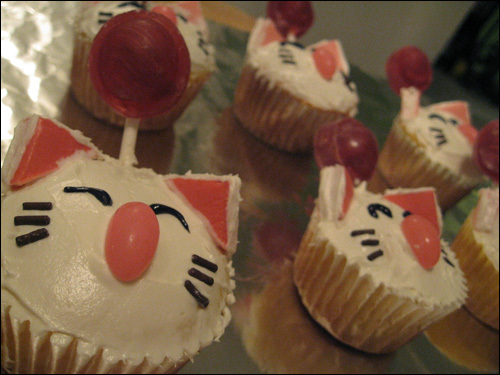 still i love to bake so i'm making some of these cupcakes as party favors! :D thanx a ton! i'm sure everyone will love them! Amazing! I just found this site (looking for WCC cupcakes for a wedding) and I love it! I hate cooking but this looks soooo much fun! I'm thinking, would the little tootsie roll lollipops they put out around Valentine's be better because of the weight, or is that not an issue at all? This page contains a single entry from the blog posted on January 29, 2008 12:22 PM. The previous post in this blog was Final Fantasy Cactrot (or Cactuar) Cookies. The next post in this blog is Final Fantasy Black Mage Ice Cream Cones.